Yann Passabet-Labiste is one of the most fascinating artists of his generation. His ability to captivate audiences with the depth and intensity of his musicality, the finesse of his sensibility, and his love and dedication to classical music, are what make him one of the most influential artists of today. Yann Passabet-Labiste was born in France. He began playing violin at the age of four and started making public appearances from the age of eight. His achievements include youngest gold medalist, 1st prize of excellence, 1st prize City of Paris and 1st prize in master’s degree with teachers Maurice Moulin, Gérard Poulet, Jean-Marc Phillips-Varjabedian, and Liliane Béguin-Rossi. At the age of eighteen, Yann was selected by France Musique from over one hundred musicians to perform a broadcast concert in the Salon Musicora. In 1998, Yann went on study with Maestro Jean-Pierre Wallez at the superior conservatory in Geneva, Switzerland where he completed his master’s degree after just one year. In 2001, he was awarded a brilliant 1st prize of virtuosity in violin, a 1st prize in chamber music (trio and quartet) with a special distinction under the guidance of Maestro Gabor Takacs-Nagy. Yann also completed his studies in baroque and contemporary music. At the age of twenty-three, Yann was awarded Laureate of the Tibor Varga International Violin Competition in Sion, Switzerland. Some of his other prizes in the international competitions arena include the 2nd and 3rd prize winner, category ‘Solo’ and ‘Chamber Music’ at the Grand Prize Virtuoso international competition in UK, and the 1st Grand Prize winner in two categories: ‘soloist with orchestra’ and ‘virtuosity’ at the 11th and 12th Concorso Internationale Di Esecuzione Musicale “Premio Citta’ Di Padova” in Italy. In 2017, Yann was the 1st prize winner at the Grand Prix d’Europe in Paris. 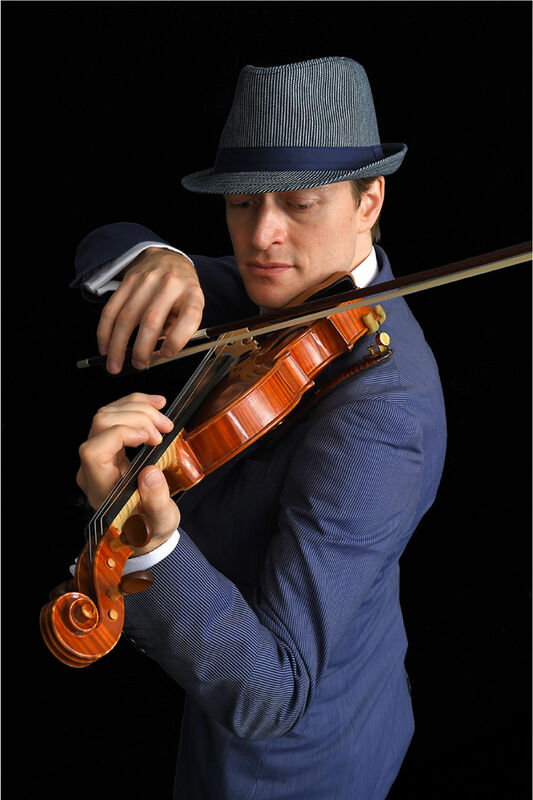 Besides his soloist and chamber music career, since he was twenty-five Yann has occupied the violin solo position in many orchestras in France as well as in Switzerland. Of special note, he was also a member of the Tonhalle Orchestra of Zürich for a period of four years. Yann Passabet-Labiste has given numerous concerts in famous concert venues and with internationally renowned artists. In 2006, he went on a concert tour for a month in Japan with the cellist Yo-Yo Ma. In 2015 and 2016, Yann was invited to play with the Japan Virtuoso and performed at Tokyo Bunka Kaikan, Hyogo Performing Arts Center and Yokkaichi City Cultural Center. Yann Passabet-Labiste plays a beautiful modern German violin from Boris Haug (violin maker in Mark Wilhelm workshop in Suhr, Switzerland), and a French violin signed by the talented Christophe Girardot (violin maker in Dijon, France). Yann has also had the good fortune to benefit from the genius of Mark Wilhelm (violin maker in Suhr, Switzerland) for sound control and production. Paris Gaveau, Pleyel, Geneva Victoria Hall, Zürich Tonhalle, Luzern KKL, Gstaad Menuhin Festival, Berlin Philharmonie, Geistag Munich Philharmonie, Baden-Baden Festival Palace, Vienna Musikverein, London Wigmore Hall, Royal Albert Hall (during the BBC Proms), Luxembourg Philharmonie, Eindhoven Zuidnederland Philharmonie, Amsterdam Royal Concertgebouw, Tokyo Suntory Hall, Tokyo Bunka Kaikan, Osaka-Jo, Okayama Symphony, Fukuoka Symphony, Hyogo Performing Arts Center, Nagano City Arts Center, Yokkaichi City Cultural Center, and more. The famous violinist pedagogue Eduard Schmieder in describing the uniqueness of Yann’s playing likened it to a very rare combination of drama and poetry. Copyright © Yann Passabet-Labiste. All rights reserved.